What’s more applicable with this sultry weather than a horror about a murderous ice cream man? Let me assure you though. Next time you see an ice cream truck, you won’t be running away in full panic and loudly screaming. Not after watching this movie at least, because this low-budget movie isn’t really scary or frightening. To be honest, I found the ice cream man (Emil Johnsen) a kind of a dork. Even during his killings, he looked rather like a sissy. I’m sure that one well-aimed smack with a scoop, would be enough to hit him unconsciously. And for the most sensitive viewers: don’t expect a bloody slaughtering as you could see in “Friday the 13th“. There’s one thing I was enthusiastic about. And that’s the ice cream truck itself. A beautifully maintained pastel tinted old-timer. Even the noise of the engine was a pleasure to hear. So this item also isn’t something to be afraid of (not like these models). Only Mary (Deanna Russo) had her doubts about it, the very first moment the ice cream truck drove by. The only peculiar thing to me was the ridiculous times this truck drove through the neighborhood while playing his childish tune. Some weird folks in this neighborhood. The whole story focuses on Mary, a so-called freelance writer who apparently has problems with writing some new stuff. So she moved back to a suburb where she once grew up. However, she has to wait a few days before her husband and two children arrive. And during that time she gets to know some of the local people. Like a couple of curious neighbor women and Max (John Redlinger), the son of one of them who just graduated. And also someone from the moving company. A scary, rough looking guy with a huge walrus mustache who acted quite intimidating. They had better promoted him to be the Ice Cream man because he looked like a real terrifying psychopath. Lets not forget about the killing? You can hardly call this a horror. It’s more a story about Mary in her midlife crisis who starts realizing that she isn’t a young teen-girl anymore. What you get is a trivial story about a woman whose hormones go berserk again after seeing a young muscular guy whose six-pack reminds her of her student time. To be honest, I didn’t think Mary was so bad looking. And in my opinion she’s is in real life much younger than the age she has in the movie. Max, on the other hand, looks older. Let’s say that Max’s acting like a stud and Mary’s behavior as a teenybopper take most of the time of this somewhat faint horror. Oh yes, it’s a horror. Thus, in addition, some innocent adolescents are being killed as well in between. Almost forgot about that. “The ice cream truck” isn’t really a very good movie. It’s not terribly bad either. It’s a dull would-be slasher. Actually, the film left me cold (how applicable). Fortunately, the acting of the main characters was adequate. The denouement was quite abrupt (and the place Mary decided to hide herself, was absolutely laughable). The makers tried to give it a bit of a horror feeling by thinking of a surprising end. But to be honest there was only one thing the film did to me. I felt like having a huge ice cream with a lot of whipped cream and red fruit on it. As a reward. 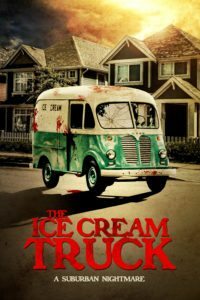 “The ice cream truck” from Uncork’d Entertainment is available on VOD August 18th. dont waste your time, this is terrible, how can it get 67% rating ??? are you people insane ?